Hard Disk manufacturing giant, Western Digital has come up with this brilliant idea of putting external e-ink screens on it's MyBook range of external hard drives that lets you see the available storage space on the external drive even when it is powered off. 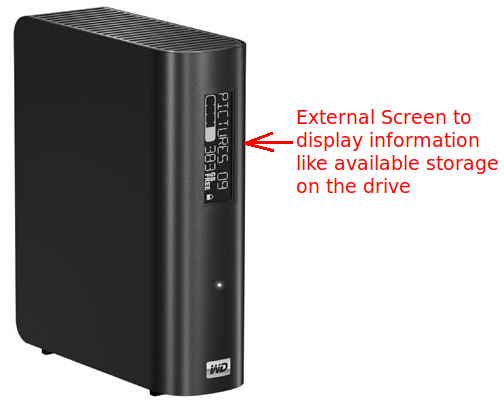 Users can customise the display and choose from a number of options that will allow them to see various information / stats about the Hard Disk drive such as available storage space, the drive’s security status, remaining capacity or number of pictures, media, or audio files currently on the drive. The screen uses a unique technology called e-ink which are high-contrast smart displays which make you feel as if you are reading ink on paper.As a result, the external hard disk drive's information also remains clearly visible even when the drive is unplugged. Thanks James.